The Heritage Pantry in Dixon is OPEN! As I pulled into the parking lot, I wondered if I was in the right place. Several tents were set up, people were bustling around, and a guy was grilling chicken on a huge BBQ. 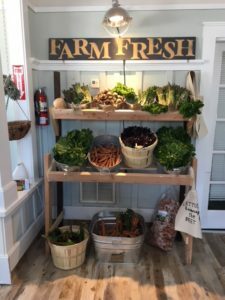 It looked more like a small farmer’s market than a retail store….which meant the grand opening of The Heritage Pantry in Dixon was off to a great start! Owned by Lindsey Hickman and Alyssa Connelly, The Heritage Pantry is “using the power of communal ideology and old fashioned homesteading skills to bring local farm goods into one place for consumer ease and education.” Located in a quaint old house (which used to be a real estate office), plenty of farm goods there were: beautiful fruits and vegetables; freshly baked breads; pantry staples such as jams, nuts, honey, olive oil, salsa, salts, ketchup and coffee; and a refrigerated case full of raw milk, cheese, eggs, yogurt, butter and meat. The shop also features essential oils, soaps, and other natural body care products. The Heritage Pantry will also serve its community by offering classes on a variety of topics. In May, you can learn to make Almond Milk (and use the pulp! ), Cheese, Kombucha and Sourdough bread. (Parents take note – there is also a breadmaking class for kids!) And on May 18, “Rooster Paint and Sip” happens, when participants can sip on wine, and paint a rooster on a large canvas. 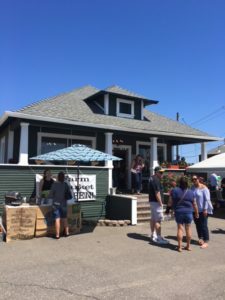 As I browsed around and watched the line of customers, it became clear that The Heritage Pantry is more than a retail store; it is a place that connects community members through local food. While Hickman’s and Connelly’s passion for local food certainly shows through the diverse array of products on the shelves, they have also created a synergy evidenced by the enthusiasm of their shoppers, and the pride of the farmers who were there showcasing their goods. It was fulfilling to see this small food system functioning, where local food is valued and appreciated. The Heritage Pantry is located at 350 West A Street in Dixon, CA, and is open Monday – Saturday, 12-6 pm. For more information visit www.theheritagepantry.com.